Please click on the below accordion to read the content of each section. All accepted abstracts will be published online on the congress website and on the journal Maturitas. Maturitas is an international multidisciplinary peer-reviewed scientific journal of midlife health and beyond. The 2017 impact factor is 3.315. Regular abstracts will be published in the June 2019 issue (printed and online). The late breaking abstracts will be published in the September 2019 issue. There is no ATM accessible on the congress site. Please plan your visit accordingly..
You will find a catering station offering various drinks and snacks within the Exhibition Area. At the end of the Congress, you will receive your Certificate of Attendance by email including the exact number of CME credits obtained. In order to count your CME credits, your badge will be scanned before the start of each session. Located within the Entrance Area of the congress venue, next to the Registration Area. Coats can be deposited at the Cloakroom for 2,50 EUR, luggage items for 4,00 EUR. The Closing Ceremony will take place on Friday,17.05.2019, between 17:15 and 17:45 in Room Dublin. Please click here to find more information on CME Credits. Please wear your badge at all times within the congress venue. Access to the congress facilities will not be granted without a proper Congress Badge. If an attendee loses, misplaces or forgets the name badge, a handling fee of 50,00 EUR will be charged for a new Congress Badge. Upon handing out a new Congress Badge, the lost badge will become invalid. 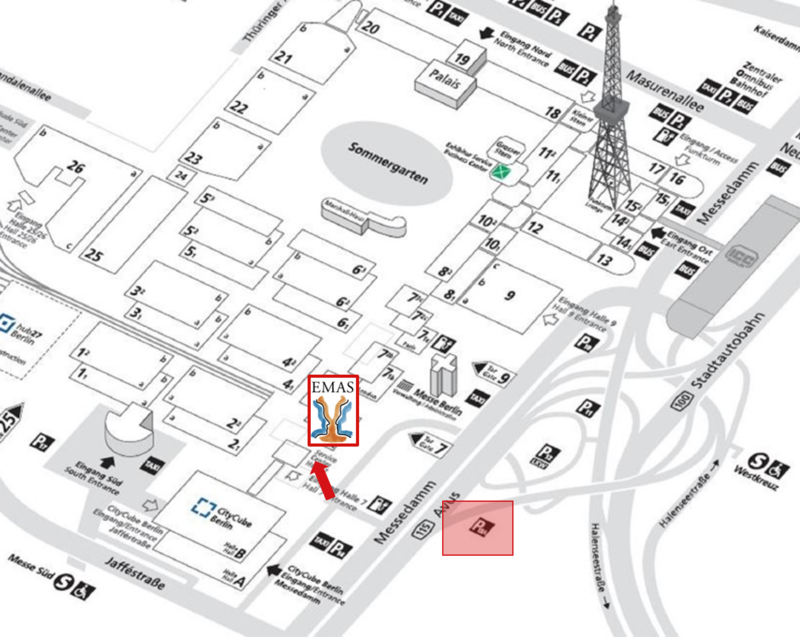 The Congress Dinner will take place on Thursday, 16.05.2019 at 19:45 at the restaurant Tomasa Villa Kreuzberg (Kreuzbergstrasse 62,10965 Berlin). Tickets for the Congress Dinner can be purchased for the price of 70,00 EUR in the Registration Area. Please present the voucher for the Congress Dinner (part of your badge) at the Tomasa Villa Kreuzberg. The Congress Material can be collected from the Congress Material Counter, located in the Entrance Area, next to the Registration Area. The official currency in Germany is the Euro (EUR). All payments connected to the 12th European Congress on Menopause and Andropause will be in Euro (EUR). NEW THIS YEAR! Your interactive open session room located next to the Poster and the Exhibition areas. A great opportunity to interact with the speakers. the organisers reserve the right to exclude the participant from the Congress. Official videographers are authorised to film sessions during the Congress. The EMAS General Assembly will take place on Thursday, May 16, from 19:00 to 19:30 in Room Helsinki 1. Every member of EMAS is welcome to attend. Found items should be deposited at the Cloakroom, located within the Entrance Area. The Congress has a Mobile App supporting all iOS and Android devices. It can be downloaded in the respective app stores under the name EMAS 2019. Mobile phones must be set to silent mode in all session rooms at all times. The Opening Plenary will take place on Wednesday, 15.05.2019, between 16:15 and 17:45 in Room Dublin. Following the Opening Plenary, all delegates are invited to the Welcome Reception for food and drinks, taking place in the Exhibition Area between 17:45 – 18:45. Posters displayed within the Poster Area have to be in produced in a portrait mode, A0-format. The congress venue is easily accessible via public transportation. It is a 5-min walk from the S-Bahn station “Messe Süd”. Public transportation is not included in the registration fee. All will receive 500 Euros and an award certificate. Authors may apply for the New Investigator award when submitting their abstract to the EMAS Congress. To be eligible, the researcher must present either a poster or an oral presentation at the Congress and must have a current passport showing that he or she is under the age of 35. It is forbidden to smoke in any part of the congress venue. We are happy to have you for the Welcome Reception and the Congress Dinner. Extra registration required for the Congress Dinner, limited tickets available. Speakers must hand in their presentation in the Speakers Preview Room at least 4 hours prior to their scheduled presentation time. 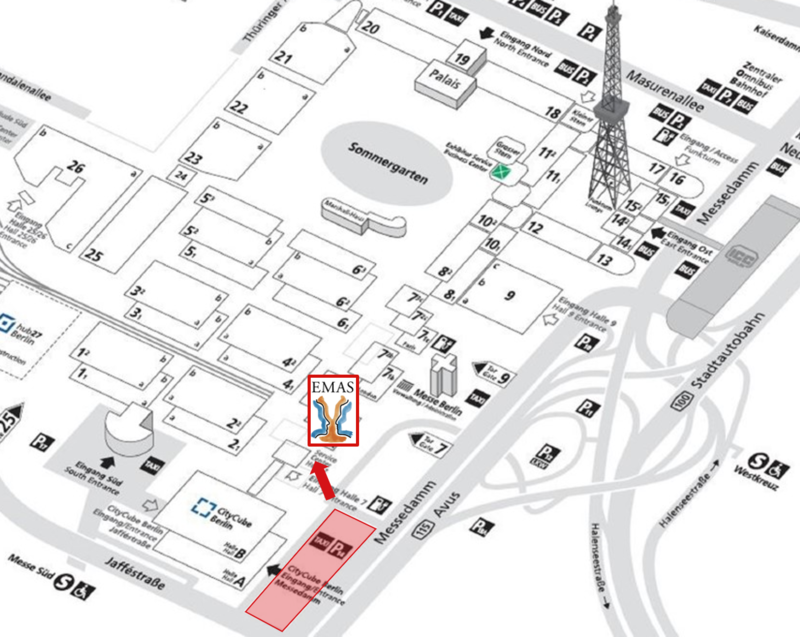 The Speakers Preview Room is located within the Entrance Area of the Congress, in front of the Badge Control Point on the right-hand side..
You will find a Taxi dispatcher outside the Congress (in front of the City Cube). Follow information about the Congress on the official EMAS Twitter – https://twitter.com/emas_online. Share your EMAS 2019 experience by using #EMAS2019. Free Wi-Fi is available for the participants in the congress venue.